With the caveat that it is definitely not for sale, OCZ showed us the incredible 4TB IBIS XL. The frankly huge storage numbers, not just huge in SSD terms but in spinning platter tech too, aren't the end of it. The performance numbers are quite something too. Apparently posting figures of 1,800MB/s read and 1,700MB/s write speed the IBIS XL would probably be done copying any data you threw at it before you'd even thought about doing it. This could be the first precognitive storage device ever. But as we said this drive is not going to be for sale, unless you've got a huge overdraft facility available to you anyways. 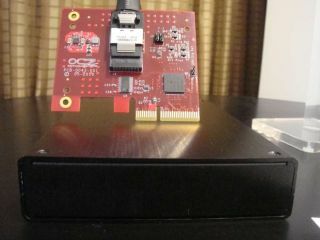 According to OCZ "it is purely to demonstrate OCZ's ability to customize their technology for virtually any application and maximize its potential." But we've seen how fast the traditional IBIS HSDL is and that's enough for us at the moment.